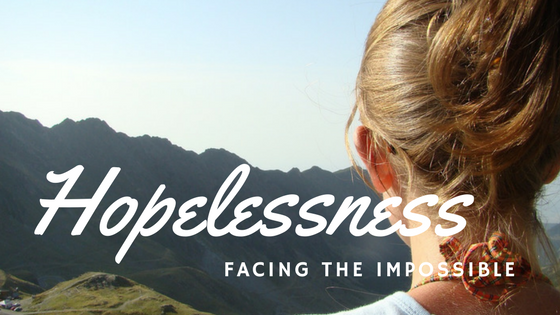 Hopelessness is living beyond optimism, usually when facing something impossible to accomplish, solve or resolve. It fills you with an incapacity to respond positively. Hopelessness bombards the core of ones faith and undermines purpose. In these last few weeks a tsunami of seemingly hopeless situations have been slamming the physical bodies, homes, marriages and ministries of people whom I love deeply. Hopeless, that is, apart from the I AM! The day started out ordinary enough. Or was it? After an exhausting night of unsuccessful fishing, Simon and his partners were cleaning their nets before grabbing a few hours rest and going out again. No fish! No pay! He knew the financial pressures of operating a business. As Jesus walked by, he was being pressed by an overly enthusiastic crowd. They were wanting to hear the word of God. I have never experienced such hunger for the word of God! Sounds like the makings of true revival to me! Historians say there would have been 4,000 fishing boats along the shore on that particular day. Jesus took note of two of them! Jesus has a purpose for everything. He approaches Simon and asks him to push from shore. Here Jesus would have a safe place to teach from in nature’s amphitheater to project his voice. The weary fisherman became a captive audience of one within arm’s reach of “the Master” who made fish and water. I can imagine the look on Simon’s face as Jesus pulled back the obstructing veil between possible and impossible. We’ve worked hard! We’ve worked long! How long has it been since hope was a consistent reality? What the darkness of night didn’t rob, the heat of the day has drained away. This one little word means “by way of opposition and distinction. It is added to statements opposed to a preceding statement.” The previous statement held the facts, “but” the Truth looked beyond Simon’s eyes to his weary soul. Jesus’ request made no sense at all! If you can’t catch fish after working ALL night, how can one possibly hope to succeed in broad daylight! One definition of insanity is doing what you have always done expecting different results. Simon surrendered to Jesus in the depth of his hopelessness. A man’s inability to provide for himself and his family leaves him with a sense of inadequacy and failure. Where am I feeling the deepest sense of inadequacy and failure? Where is God inviting me to enter into “the deep” and try again? What Jesus is asking of me at times seems impossible, unreasonable, and beyond my capacity to fulfill! Obedience? Yes, obedience. The outcome is God’s part; obeying is mine. that their nets began to break. Insane maybe! Nevertheless, Simon’s act of obedience in the face of the impossible set him up for a miracle of maximum capacity. The nets could hold no more! Not one more fish! Our greatest ally can be fear, as it draws us into a reverent submission and worship. Having his hopelessness uncovered was one thing! The grace of God exposed every sinful point. Just recently there was far more month than paycheck. I had no tangible way of meeting a mortgage payment. Many times I had prayed for provision. Each day looked bleaker than the day before. In the morning I tearfully vented my frustration and honestly processed the hopeless and helpless position I was in. The evening of that same day, God’s grace broke through in miraculous fashion. Now I found myself on my face repenting for my lack of faith and trust. In the awareness of undeserved favour, tears of gratitude flowed unhindered. not finishing well or pleasing God. “Don’t be afraid; from now on you will fish for people. Simon left the sea and the life he knew well. It was a life that prepared him for what was to come. Jesus helped Simon to confront his fears, failures and hopelessness. Simon’s obedience became a life transforming moment. “But!” The little word that sits between two opposing realities! The impossible of man becomes the I Am possible of God! So needed to be reminded! So Good! Thanks Sis!! Bless You! Love You!